Has-Been Heroes Review: Perfect for the Switch | Nerd Much? I don’t know about you, but I’m definitely feeling the open world fatigue right about now. So, when games are announced that don’t take the massive world route, I take notice. That’s just one of the reasons Frozenbyte’s Has-Been Heroes caught my eye initially, and there are so many other reasons why it became one of my most anticipated games of 2017. Sure, it doesn’t quite come with the pedigree and expectations as something like Breath of the Wild, Mass Effect Andromeda, or MLB The Show, but I think that’s also part of its appeal; it’s an undeniable underdog in a March filled with other big-name releases. 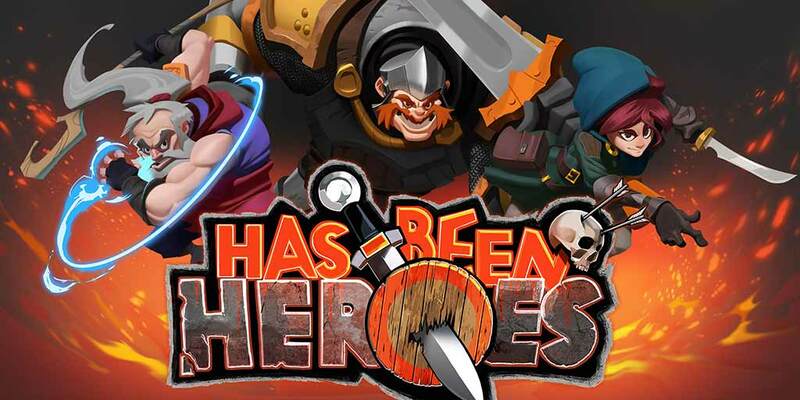 But does Has-Been Heroes deserve any of the March spotlight, or does it deserve to be buried by AAA titles? In short, Has-Been Heroes is well-worth your time. There’s a lot to love about this indie-feeling title (despite being published by GameStop). Most notable is the game’s high replayability. It’s a game that is played in short bursts, with players trying to traverse through different regions (randomly generated), defeating that region’s boss (randomly generated), and picking up new items and skills at crossroads along the way (also randomly generated). So, each “round” of play is different than the previous, and you never know what region, boss, or items you’re going to get. This ever-changing aspect of the game provides for some great gameplay opportunities that always feel fresh, and even 15 hours in, I’m still enjoying each playthrough. You’ll start out with three heroes, controlling each in three specific lanes. As you battle, you’ll have to find ways to defeat the massive wave of enemies ahead, which plays out like a game of Plants vs. Zombies, but more intelligently than that. You’re tasked with finding the best combos between the three heroes as to best punish your enemies, with basic melee attacks and special abilities, all while managing your stamina. 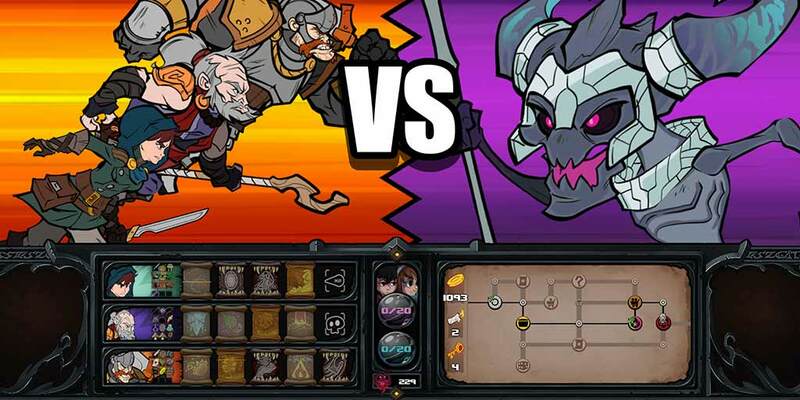 To defeat your foes, you’ll have to switch between the three heroes, changing their lanes based on their stamina, their enemy’s stamina, and the abilities and buffs available. What’s more, each hero regens their ability to attack at different speeds, so you’ll find yourself trying to place the warrior (which regens quickest) in the most opportune lane for the next turn. It’s these types of minor strategies that can make the difference between moving onto the next battle or being defeated and having to restart the game entirely. That’s right — once you’re dead, you’re sent back to the start without any of your previously earned abilities, items, or progress; do not pass go, do not collect $200. This means, despite how far you might venture in the previous round, you’re sent back to the beginning each time. There are two sides to this coin. On one side, it provides an incentive to get better and find those devastating combos and quirks that will make it easier for you to advance next time. But on the other, there’s the frustration that you might not be able to see all of the unique enemy types, bosses, items, and spells that the game has to offer. And on that note, there are so many items, skills, heroes, and regions contained in the game — all of which are unlocked by collecting souls, progressing through the game, unlocking chests, and more. The game also has 10 different endings. So, again, there is plenty here to keep you engaged. The game’s difficulty curve is also noteworthy. It starts out as tough to understand, and the controls are, at first, confusing when playing on the Switch (mostly due to the Pro Controller’s differing button layout in comparison to the Xbox One’s controller that I use so frequently). So, it frequently caused confusing when the game tells you to “Hit Y” then “Hit A”, which is entirely different than the Xbox One’s controller. But once I was able to remove that sort of mental block, switching heroes between lanes and comboing became second nature. Boss battles are also delightfully difficult, and each boss has its own quirks and weaknesses that you’ll have to figure out. Technically speaking, there wasn’t a single hiccup in my playthrough on the Nintendo Switch. No screen tearing, no framerate drops, or no crashes occurred while both docked and on the handheld. 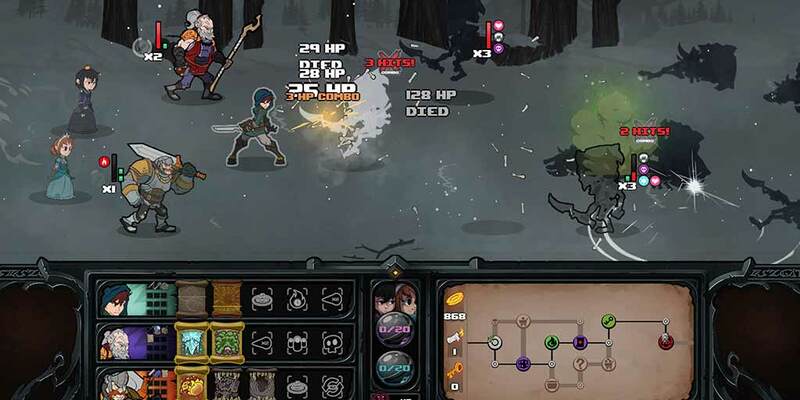 The game looks great, with colorful spells and environments, and the characters are well-designed. Character animations look great also, with each character’s cartoony vibe fitting well within the game’s overall aesthetic and aura. The sound design is mostly commendable, with battle hymns serving as the backdrop to your adventures. My only gripe, however, is that they become repetitive quickly (luckily, there’s a music volume slider in the game’s options menu); I would have liked to have seen more variety. As far as other negatives are concerned, I’m mildly annoyed that the game doesn’t give me any sort of names. Apparently, unless I’m missing something here, the has-been heroes don’t even have any names. If we’re supposed to care that they’ve been enlisted to fight the numerous monsters (which, for the record, are also unnamed) scattered about the lands, shouldn’t we at least have a name for our heroes? It’s by no means a game-breaker, but it’s a minor irritation that I can’t refer to my warrior as Bob the Strong or, hell, even name him as such, myself. But 18 hours in, and I’m still finding joy in seeing how far I can get and what sort of cool items and spells I can unlock to use next time. I’m not sure if the game would work as well for such an extended period of time if I were tethered to an Xbox One or my PC to play, but the Nintendo Switch appears to provide for the best gameplay experience. The game plays incredibly well on Nintendo’s newest console, and Has-Been Heroes feels like it was developed with the Switch specifically in mind. If you’re a Switch owner looking for another great game to play on the go, Has-Been Heroes has a lot to offer.